If you're traveling to Asheville, NC and only have time to stop at one shop, may I suggest Screen Door. At 25,000 square feet, Screen Door houses dozens of rooms filled with cool treasures, original work and antiques from over 100 vendors. In a space this large, you'd expect your share of junk items but it's hardly the case. Every turn and glance around this space offers up something unique that oozes good quality and design. I always loved the English poster Work Hard and Be Nice to People. This sign offered the same sentiment but in a more rustic look, which I love. I lean towards mid century modern in my decor and some of the pieces here are really fabulous. Frank Capps, who manages and styles many of the booths, shows some great examples of mixing new with old. 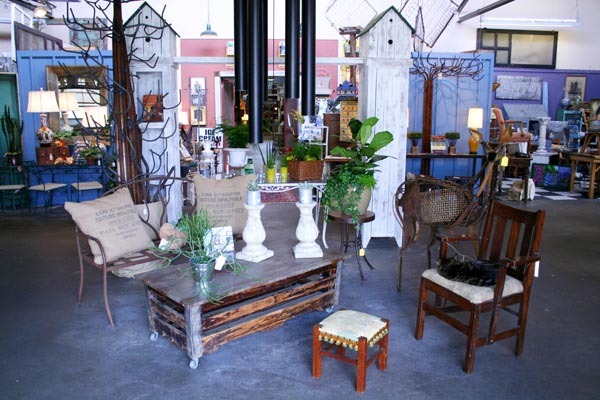 Screen Door is also the perfect place to go gift shopping or to just pick up some fun soup spoons or vintage glassware. This is a destination you'll want to spend some time at so I'd give yourself at least two hours to peruse in peace. (and if you like design books, you won't want to miss their attached bookstore) What I love most about Screen Door is you can always walk away with a little something, no matter your budget. Not to mention that the item you do buy, once carefully placed in that perfect nook or wall space back home, always begs the question from friends, "Where'd you find that?"